Scotland and the tropics seem to have little in common, aside from copious amounts of rain. However, Scottish institutions are at the heart of a number of tantalising research projects looking at tropical ecology and biology. In this blog post, PhD student Laura Allen (@laurajallen) gives us a glimpse of this work, with a look at a recent conference she organised at the University of Glasgow. Laura has a wealth of experience in tropical biology, having worked in Ecuador, Bolivia, Peru and Trinidad. 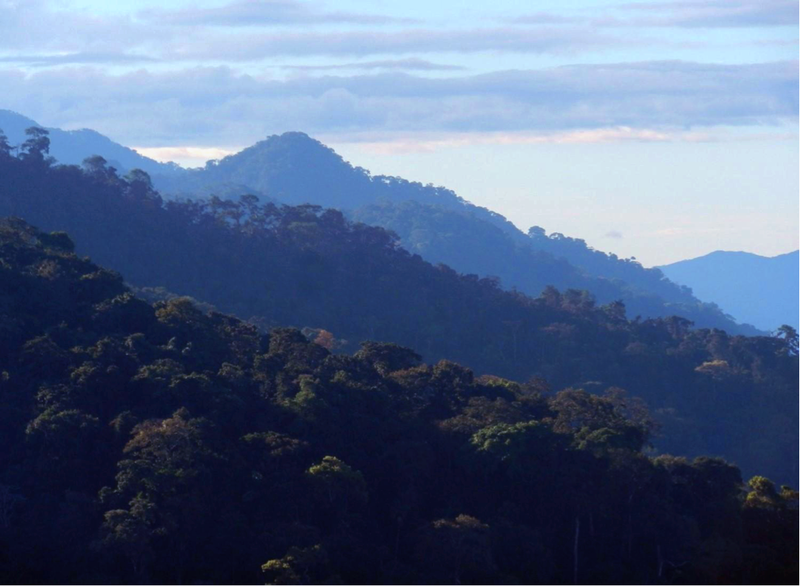 Her current research, jointly funded by the Crees Foundation, looks at regenerating tropical forest in Peru. View from the Piñi piñi range, Manu, Peru – Photo by J. Villacampa, The Crees Foundation. 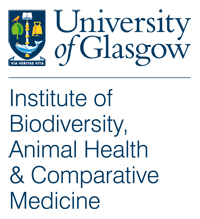 Scottish tropical ecology and biology seems like an unlikely theme for a meeting, and yet last month the University of Glasgow played host to such an event for the third time. The first meeting, back in 2013, consisted of around 30 people huddled into one of our smallest lecture theatres; this year we had over 100 attendees, and a collection of speakers that could compete with many well-established conferences. As I stood at the front of our largest lecture theatre that morning, I reflected on the months of planning and hundreds of emails that had brought together so many people from different places and varied backgrounds. As the last attendees took their seats I considered the witty and poignant introduction I’d planned to give, but conscious we were already running late, I hurriedly said good morning and introduced our first speaker. STEB, as it has become fondly known, is a small venture with big aspirations. We want to bring researchers from universities and organisations across Scotland (and beyond) together to share their experience. We aim to include as many subjects as possible within the realm of tropical ecology, and present professional scientific research in a way that is also accessible to amateurs. Tropical ecology and biology is a broad theme, and this is one of the great appeals of STEB. Whilst many of us work in similar regions, our research can be so diverse that we seldom get the opportunity to find out about neighbouring projects that lie outwith our speciality; STEB rectifies this. The range of talks covered this year included everything from plant taxonomy to avian behaviour and fish physiology, ensuring there were topics of relevance to biologists from almost any field. However, STEB is not just for scientists. There are many people out there who are enthusiastic and interested in tropical biology, but not everyone chooses it as a career path. While many (excellent) public engagement events are primarily designed for non-specialist audiences, but often attended by scientists as well, at STEB we aim for the opposite. By ensuring this event is kept open, it provides an opportunity to generate enthusiasm and engage general audiences with research first-hand. We want to produce a day where top-quality researchers present real science for a scientific audience, yet ensure that everything is kept accessible and welcoming; this way anyone with an interest can join us and end the day with an expanded understanding of what goes on in ecological research. Whilst the calibre of the presentations is hugely important, STEB also plays a valuable role as a platform for early career researchers to gain experience communicating their work. I was delighted to have a range of speakers at STEB2015, which included experienced experts as well as undergraduate students who had just completed their first research projects. 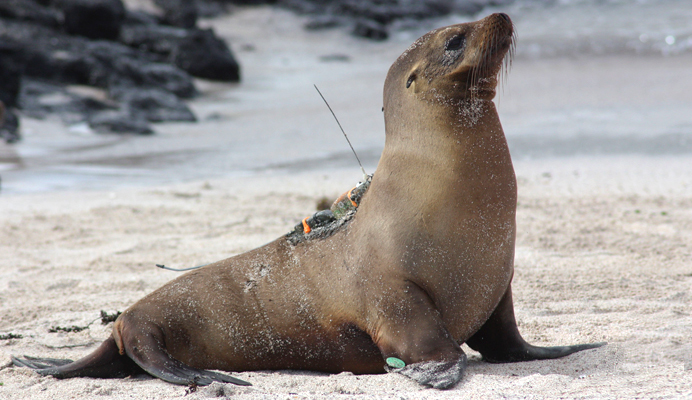 Highlights of the day included our plenary speakers; Dr Jana Jeglinski told us about tracking Galapagos sea lions and Galapagos fur seals with GPS loggers, which together with collecting stable isotope data, enables them to explore how diet and movement patterns vary between adult and juveniles of the species. This provides insight on how foraging and competition can influence both the size and the age make-up of populations, and how species that live in overlapping ranges avoid conflict by adopting different patterns of resource use (e.g. foraging at different times of day). Continuing in the marine environment, Dr Shaun Killen took us across the world to the Great Barrier Reef, where he introduced us to the engaging dramas in the life of damselfish. Shaun has been looking at how metabolism can predict the competitive ability of an individual, and how the presence of predators can affect their metabolic rate. I found it particularly fascinating that, whilst the presence of intermediate predators (mesopredators) led to the prey species expending extra energy through stress, having a top predator around (that would eat the mesopredator) reduced this effect. 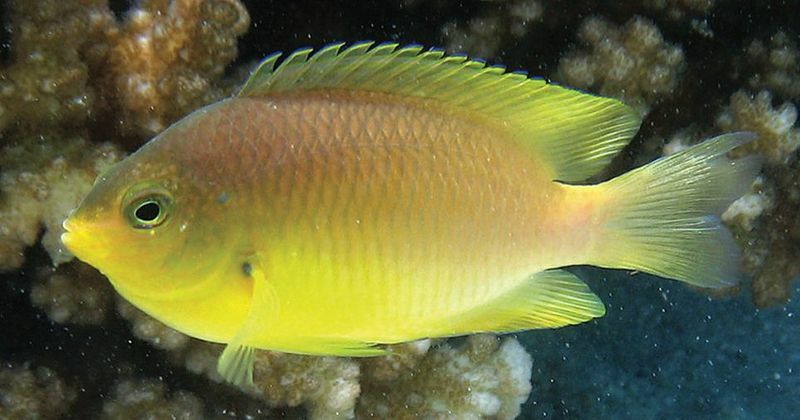 I found it surprising that the damselfish had such a distinct, albeit sensible, physiological response to the presence of different predators. Our third plenary talk was very different, both in environment and style: Dr Ross Piper introduced a touch of TV glamour, presenting us with some of his findings from the BBC expedition “Wild Burma”. This part of the world has been politically isolated until very recently and the BBC expedition was a rare opportunity to collect data on the wildlife of the area. In a six week expedition, Ross and his team used camera traps, mist-nets, cage traps and interception traps, among other methods, to conduct an intensive inventory of the biological diversity of several sites in the country. They discovered over 56 mammals and more than 200 bird species, as well as huge numbers of invertebrates, several of which are new to science. For an area threatened by logging, poaching and mining, evidence of such rich biodiversity can provide valuable support for improving conservation efforts. When preparing the schedule for the day, I found it difficult to avoid my preferences creeping in. It would be dishonest to pretend I don’t have favourite topics – anyone that has known me even briefly will know how much I love rainforests and frogs, yet I have rarely raved about taxonomy. Fortunately I have good people around me who are passionate about different subjects, which helped me avoid such bias. I’m glad this was the case, as the best short talk of the day was awarded to Eleanor Drinkwater, who presented her work on the taxonomy of Begonia. This turned out to be a fascinating subject and incredibly well presented. One of the reasons I enjoy STEB so much is the delight I get from hearing about things I wasn’t even aware I was interested in. In addition to our long list of amazing speakers, we also had a poster session, which included contributions from the Glasgow University Exploration Society, as well as several independent organisations. We had an award for best poster, which went to Davide Dominoni for his poster on the hornbills of Bhutan, describing their importance in seed dispersal and his use of telemetry to track their movements and relate these to habitat. It was extremely rewarding to be involved in organising the Scottish Tropical Ecology Conference this year, and I hope that next year it will continue to grow. I look forward to increasing the involvement of other universities and organisations at future meetings. This will expand the shared pool of expertise, and hopefully stimulate lasting friendships and collaborations. Acknowledgements A big thanks needs to go to Andy Whitworth, who has been involved in STEB from early on, and continued to be a driving force this year despite being busy finishing up his PhD. Also thanks to everyone else who provided advice and helped out on the day. Finally, thanks to The Crees Foundation, for supporting our tropical research and carrying out some amazing conservation work. For more about Scottish Topical Ecology, watch some videos made of last year’s STEB meeting.